The Oregon Legislature has passed a bill which creates a compact between the state and school districts holding districts accountable for certain measurements originated by the new OEIB super board. · Defines key measurements and sets goals for the Governor and legislators’ progress. · Achieves fully-funded educational goals by measuring legislative progress and uniting the legislature around these goals. · Allows comparisons of outcomes among legislators – spotlighting best practices to share and expand, and allowing diagnosis to overcome obstacles. · Encourages the Governor and legislators to connect budgets and improvement plans to shared goals of fully-funded, state-wide education. · Helps the Governor and legislators to determine how much progress they can make with the best use of state and local funds – and how they might invest dollars in ways that deliver fully-funded traditional programs at the school level. · Provide parents and students with clear information about how their Governor and legislators are performing, allowing comparisons based on the most significant outcomes. 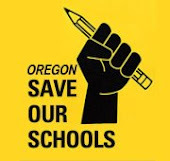 · Allows Oregon to replace provisions of No Child Left Behind, the federal waiver, and the overemphasis on testing and teacher accountability with funding allowing for school program additions instead of program cuts. You will be evaluated on meeting your benchmark of fully funding a traditional public education in the state of Oregon. Legislative Session Ready: Is the Governor/Legislator ready with plans for the legislative session to fully fund education? Progression: Is the Governor/Legislator making sufficient progress on a fully-funded QEM? Equity: Do the Governor’s/Legislator’s plans call for full funding for all buildings and populations of students? Progression: Do the Governor’s/Legislators plans free up instructional time by reducing the over-emphasis on state testing? I hereby enter into this compact with my constituents, the undersigned. How About an Achievement Compact for our Governor? Readers, there's a groundswell of people asking our Governor and legislators to sign an achievement compact to take action on school funding. I encourage every reader to send such a request to the Governor and your state representative and senator. Here's a draft letter that you might want to adapt from. I wish to propose an agreement with you. We have watched a decade of state disinvestment in our public schools. We have seen more than 15% of our local educators terminated just over the past three years. We have seen the agonizing decisions to eliminate a wide range curricular offerings that our children need, but our school board has been forced to cut. We have watched the struggles of growing numbers of children and their families living in poverty, but without necessary additional resources to adequately address their learning needs and remove their learning barriers. Now is the time for all of us to act! As your constituent, I respectfully request that you commit to, sign and return the enclosed Governor/Legislators Achievement Compact. Such an agreement will be the first major step in our working together to redress the decade of disinvestment in our treasured public schools. Our future democracy demands it. We have carefully examined the current version of proposed rule changes for teacher and administrator evaluation. We find four major issues in these changes. These issues are explained below. 1. Since Section(1) says that the "standards shall be customized based on the collaborative efforts of the teachers and administrators of the school district and the exclusive bargaining representative of the employees of the school district, Sections (2) and (4) are unnecessary and abrogate local decision making prerogatives. The state has failed to make clear the compelling reasons for any of the proposed changes---all of which are more prescriptive by the state. 2. By listing "student assessments" in Section (2) and "formative and summative assessments" in Section (4) as possible measures that can be used in personnel evaluation, this draft actually validates using test scores to evaluate teachers and administrators. This practice has been decried by the nation’s ten most highly respected testing experts. See http://www.epi.org/publication/bp278/. Given this compelling evidence, shouldn’t the state forbid this practice rather than validating it? 3. It is unclear from the annotations in the proposed changes whether the suggested rules changes propose a complete deletion of Section (3) (c). That section states: "Allow teacher or administrator to establish a set of classroom or administrative practices and student learning objectives that are based on the individual circumstances of the teacher or administrator, including the classroom or other assignments of the teacher or administrator. The unique context in which teachers and administrators work greatly impacts their work, and this context must be considered in effective evaluations. If the intent is to entirely eliminate this section, we vigorously oppose that deletion. 4. Our final deep concern is that this draft of rule changes attempts to implement elements of an evaluation bill that failed in the last legislative session. By refusing to pass legislation that would have clearly violated principles of local control, our legislature has spoken. Rule-making such as proposed in this draft clearly violates legislative intent---and core principles of local control.